See the announcement for the full list of winners and some back story about how their stories were written. 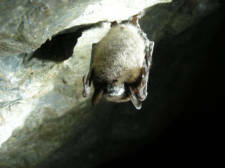 Image: little brown bat affected by white-nose syndrome. Image from the US Fish and Wildlife Service national Digital Library. (Public Domain). Read Nijhuis's "Crisis in the Caves" to learn more about how this fungal disease is decimating bat populations. Are you tired of apocalyptic futures where humanity is enslaved by aliens, or we destroy the environment or each other? George Dvorsky looks at seven science fictional visions of the future that have a happy ending for humanity. Maybe I'm boring, but I were able to choose, I think I'd prefer a future not so different than today ("status quo") but with cleaner air and more green spaces ("bright green Earth") here on Earth, and colonies out in our solar system ("boldly go"). I'm skeptical of post-human futures that involve uploading our minds to computers or otherwise transcending our physical bodies. Even if that were possible, I suspect that many (or even most) of us would be loathe to leave the real world behind. I personally like having corporeal form, even with all its flaws.